Construction and development plans seem to plod forward relentlessly, ushering in change even when the cogs of the planning machine come grinding to a halt. Meanwhile, proposed solutions become ever more contentious. Take 2000-2070 Bryant. When developers announced an indefinite hold on the planning process to make some community-spurred adjustments to their proposal, some opponents celebrated. 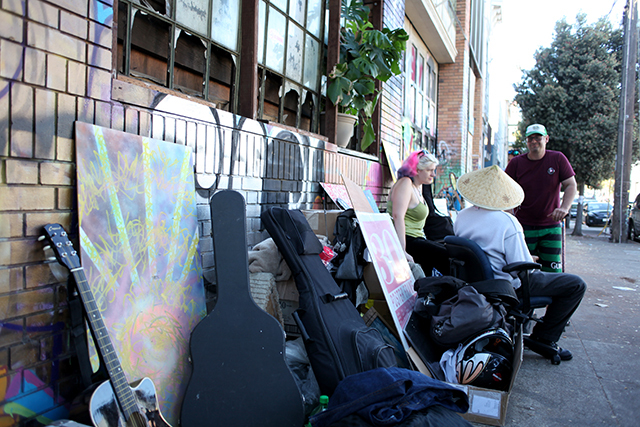 But on Wednesday afternoon, the subtenants of Inner Mission, who had been working and living there for between four and 10 months, came up against their eviction deadline set in court a week earlier and all three began moving their belongings to storage and themselves to friends’ couches. The eviction, derailed by a time frame that proved too tight, leaves Inner Mission master tenants Eric Reid and Mike Gaines in place. Inner Mission struck a deal earlier this year with Bryant street developer Nick Podell to ensure relocation payments. The arts organization is now the only tenant left in the building. So the little is settled except the project will be delayed. Meanwhile, the protests continue amid disagreement on what will be effective. Protesters again arrived at City Hall Thursday, but this time to ask for legislator’s support on specific proposals, including Proposition I, the Mission Moratorium. Few officials were present (or willing to engage the protesters). But the moratorium was just called out by a city report as basically doing nothing. Ted Egan, the city’s chief economist, released a report this week saying that the moratorium would have no real effect on no-fault evictions and would probably slightly raise housing prices around the city – by between $15 and $174 a year per renter citywide, which shouldn’t faze any newcomer in the context of local housing price standards. Between 97 and 131 affordable units that are tied to market rate developments that would be delayed by the moratorium would, of course, also be delayed. But Egan’s commentary goes a step further: He writes that there isn’t much correlation between building new housing stock and prices going up. 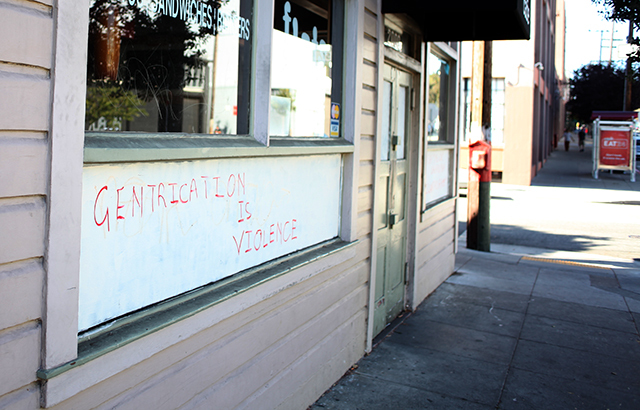 The Mission’s dramatic gentrification (which a study recently classified as ‘advanced,’ surprising no one) happened during a net loss of housing stock and some 97 percent of newcomers are moving into existing, not new housing, he found. More on that at the Business Times. The Yes on Prop I campaign issued a rebuttal yesterday, saying the report only considers the moratorium’s effect on supply and fails to consider how an the demand for housing influences displacement. He also wrote that the proposition’s purpose goes beyond a pause on housing and includes a mandate to change policy to have a longer-term influence on housing. Of course there’s no shortage of different proposed remedies for evictions. Tenant Protection 2.0, a regulation change proposed by Supervisor Jane Kim earlier this year, is coming before the Land Use Committee on Monday and is one of the proposals protesters were rallying for yesterday. The policy would require landlords to rent an apartment at the previous tenants’ rent controlled rent after certain kinds of no-fault eviction to discourage no-fault evictions for the purpose of raising rents. Ellis evictions already prevent landlords from renting the unit for ten years, and owner move in evictions have a similar restriction. It would also put the kibosh on evictions for minor offenses, as well as for moving additional residents into the unit or for the unit being illegal. We’ll definitely keep you updated on that one. Housing isn’t the only arena in which people are duking it out over solutions. With so many new arrivals, transportation is a major concern – not only in terms of parking, which we heard some frustration over in response to our story about parklets, but also in terms of public transit. Supervisor Scott Wiener has called for an aggressive expansion of the city’s transit system, primarily into the western and southeastern neighborhoods of the city. His subway master plan goes before the land use and transportation committee this fall. Improving bus transportation just isn’t enough, Wiener argues. It has to be subway if it’s going to be efficient – even if it’s going to be expensive.